Dom P. Malchiodi, who was born in Chester, Connecticut, but grew up in the Bronx, New York. He signed with the New York Yankees’ organization in 1941, and played a handful of games for Wes Ferrell’s Leaksville-Draper-Spray Triplets of the Class D Bi-State League that year. The Triplets won the league title with a 64–46 record but were beaten in the playoffs, four games to one, by Danville-Schoolfield. He spent the 1942 season playing in Canada, first with the Trois-Rivières Renards of the Class C Canadian-American League and then the Quebec Athletics of the same league. The young catcher played 27 games in 1942 and batted .272. Malchiodi’s brief career in professional baseball ended at that point as military service beckoned and he trained as a bombardier with the Army Air Force. He served in Europe with the 495th Bomb Squadron of the 344th Bomb Group, Ninth Air Force, a Martin B-26 Marauder outfit that supported Allied forces during the Battle of the Bulge, and continued to strike supply points, communications centers, bridges and marshalling yards from its base at Cormeilles-en-Vexin in France. The 344th Bomb Group flew its last operational mission on April 26, 1945, and with the surrender of Germany on May 7, the group was at Florennes-Juzaine in Belgium. For Malchiodi, baseball was on his mind, and he wrote home during the spring telling his mother how they had got a bulldozer and were going to plow out a diamond and form some teams to play ball while waiting to go back stateside. Nevertheless, military duties continued and the group conducted regular training flights, including simulated attacks on target rafts at the Blankenburghe Gunnery Range in the North Sea off the coast of Holland. On May 31, 1945, Second Lieutenant Malchiodi was the bombardier with a new crew that was led by pilot First Lieutenant Harrell Foxx. 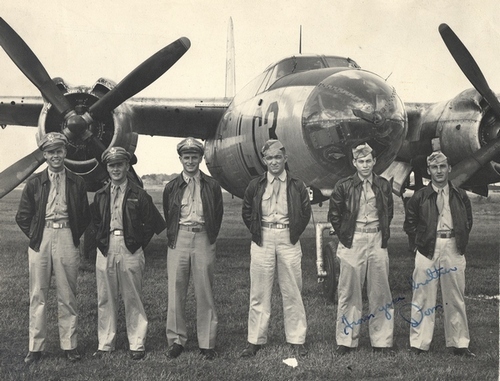 Foxx led a formation of six B-26Gs in a strafing run at the gunnery range and after making his pass, he announced over the radio transmitter that part of his plane’s tail had been shot away by his own turret gunner. Foxx headed straight for land as the rest of his echelon followed in loose formation from where they could see that all but four feet of the right horizontal stabilizer was missing, there were holes in the base of the vertical stabilizer and the left horizontal stabilizer was almost shot in two. Foxx intended to land at the first available airfield and as the plane reached the coast of Holland, he started a slight turn. At this point the left stabilizer broke off and the plane nosed into a steep dive, hit the ground and exploded on impact. All seven crew members were killed. Malchiodi was originally buried at the Netherlands American Military Cemetery, but his body was later returned to the United States and now rests at St. Joseph’s Cemetery in Chester, Connecticut.